I'm out on "The Big Island" Kona in Hawaii on vacation over the holiday. Despite being here before there's still a huge adventure of stuff check out all completely different from last time. Here's day one and there's a heck of a lot considering we only spent half a day. We managed to get in just past noon and settled into our accommodations and decided to look for a bite to eat. Our intended destination became our dinner so we ended up at the "food court" at the Queens' Marketplace at Waikoloa beach. Little did we suspect we were walking into some really neat local establishments. Our first stop was at Ippy's Hawaiian Barbecue, housed in the same building as an Arby's and DQ (Dairy Queen) I thought it was just another chain fast food. Apparently not! Owner Philip Aiona was a finalist on the 2012 Food Network Star and boy did we ever luck out. I ordered the "Hawaiian plate" which consisted of teriyaki beef, kailua pork and loma loma salmon served with rice and mac salad. My wife liked the beef she liked the teriyaki glaze on the thinly sliced beef, but I felt the pork was the real winner, extremely moist and tender and seasoned nicely. I literally scraped every last bit off the styrofoam container. The salmon was a touch salty without the rice, I think it's because it looks like they are using a smoked salmon. I added some garlic wings to go with the meal. The wings were in a sweet garlic sesame sauce. It went really well with the rice on the Hawaiian platter. We might have to go back because the rotisserie chicken smelled amazing. While I was busy ordering bbq my wife was on the hunt for some soup and went with this place across from Ippy's called Lemongrass (link is to their main store not the "express" at Queens' Market) and she ordered the Tom Yum Shrimp soup. WOW. This is a coconut based soup but unlike anything I've tasted before. Tom Yum soups are typically pretty thin and have a bit of protein and very little else. This soup was packed to the brim with straw mushrooms, white onion slices, plum tomatoes, keffir lime leaf, leeks, green onions and a lot of shrimp. The soup was extremely creamy in consistency and had enough stuff in it the bowl to really filled you up for a meal. We had to kill a bit of time before we hit dinner especially since we filled up at the food court. So we headed out to the King's Market place up the street which features higher end jewelry and art stores but we were fortunate enough to run into Jim demoing a wide variety of jams, jellies, honeys and butters. 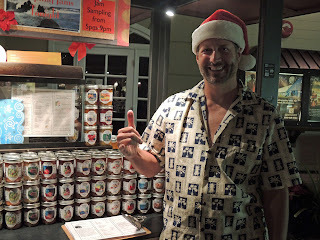 Honomu jams and jellies are produced at and by his farm brother. Very delicious stuff, the previous customers had provided an on the spot unsolicited testimonial (to which were were like, "um yeah we'll be back"). We ended up placing a 12 bottle order back to be sent back home. His brother is a wizard at flavors I think there were more "unlisted flavors" than listed on their brochure. 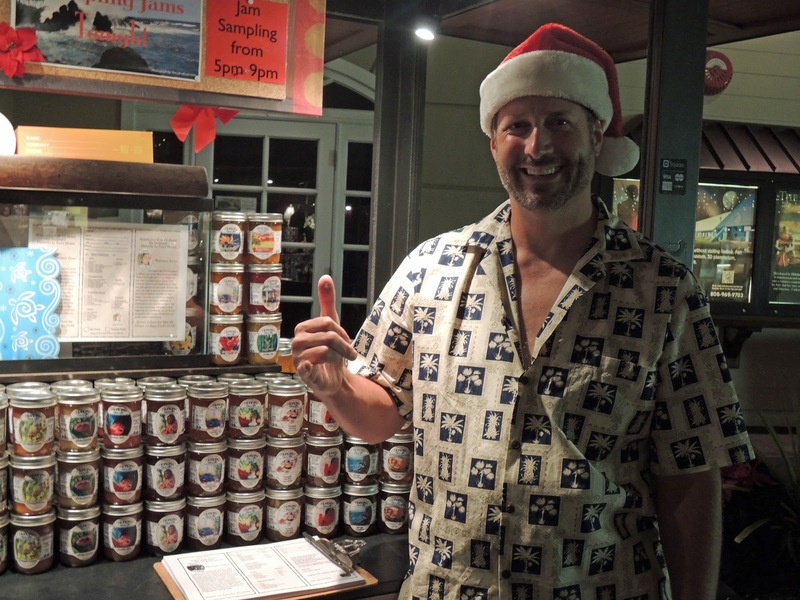 We spent some time speaking with Jim topics ranging from his detailed description of the various flavors of preserves to his own travels in Hawaii. Jim has his own blog and is starting his own book this year. He was nice enough to give us the skinny on the food scene on Kona and we plan on hitting as much of those that we can. Finally dinner, since Hawaii has a heavy Japanese influence to check out the closest place that had a good recommendation for their ramen. So we went to Sansei seafood steak and sushi bar at the Queens' Market. We weren't holding out much hope at first glance after all there was only one menu item for ramen soup. This wasn't a surprise since most japanese restaurants don't focus much on ramen since their real demand (and money) comes from sushi and the various house specialties. Our server mentioned that the "dk's crab ramen with truffle seafood broth" was a big hit. Again having low expectations we went for it. The broth was pretty good, thin but good a hint of truffle played nicely with the seafood undertones (not as overpowering as I had expected). The noodles however were delightful just like our Michi experience, so I inquired about the source. Apparently they were fresh made at one of the other DK restaurants in Maui and flown over. If you get over here (or better yet from the pasta shop in Maui) it's worth going over and checking out. Our server was nice enough to get us more broth (there wasn't much) so we could take home our extra noodles, it turns out the broth was from the "standard" ramen which was a miso based broth. Tasty but not nearly the broth we had at Michi. Still we were very happy with our ramen experience. Finally a few callouts. This was the grilled Hamakua Shiitake Mushrooms (which Jim said to always get if it appears on the menu). It was in a Soy-Ponzu sauce. Seared Foie Gras Nigiri Sushi. It was glazed with what usually comes on Unagi (bbq eel) it was accompanied with mango and carmelized onions. Both delicious and controversial. This is a picture of a order of nigiri Uni (sea urchin) my favorite thing. I was wondering if there's any difference from the stuff I usually get states side. I was amazed at the size of the usually the uni is about half the thickness of the piece above. The uni had a richer cleaner taste than any I've had in the past. I'll have to check out another sushi restaurant to see if this is true for all over the island or if I lucked out. Ok well if that was half of day one what will day two bring. We're going to check out Jim's recommendation for breakfast tomorrow.